Sean Rafferty with a lively mix of chat, arts news and live performance. Sean's guests include Nadine Benjamin, Ronald Samm, Daisy Evans and the Van Kuijk Quartet. Sean Rafferty with a lively mix of chat, arts news and live performance. 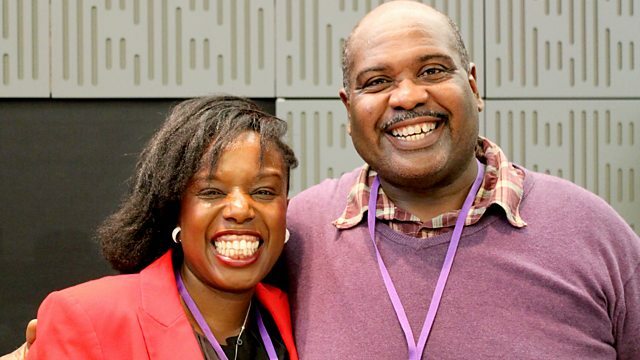 Sean's guests include soprano Nadine Benjamin and tenor Ronald Samm who sing live in the studio ahead of performing at the launch of the Voice of Black Opera competition. Opera director Daisy Evans talks to Sean about her new production of Purcell's King Arthur at the Barbican, and the Van Kuijk Quartet perform music from their latest CD. And to mark National Poetry Day, Sean talks to its founder William Sieghart. Performer: Alexis Kossenko. Ensemble: Les Ambassadeurs. Performer: Ronald Samm. Performer: Cyrill Ibrahim. Performer: Nadine Benjamin. Performer: Cyrill Ibrahim. Music Arranger: Margaret Bonds. Performer: Nadine Benjamin. Performer: Cyrill Ibrahim. Performer: Iain Burnside. Singer: John Mark Ainsley. Performer: Paul O’Dette. Performer: Laurence Dreyfus. Singer: Sylvia McNair. Conductor: Christopher Hogwood. Singer: Stephen Varcoe. Orchestra: English Baroque Soloists. Conductor: Sir John Eliot Gardiner. Performer: Chloë Hanslip. Orchestra: London Symphony Orchestra. Conductor: Paul Mann. Ensemble: I Musicali Affetti. Ensemble: RossoPorpora Ensemble. Performer: Natalie Clein. Orchestra: BBC National Orchestra of Wales. Conductor: Andrew Manze.